I am of Italian descent from the greater New York City area, so it should be no surprise that I love pizza. My interest was piqued when my niece Samantha recently posted a ranking of the “101 Best Pizzas in America," according to the Daily Meal® website, which conducted the voting on 700 pizza shops by 78 food experts. The list contains the name of the restaurant, its signature pizza, and its city/state. I decided that this data was worthy of bringing into JMP and exploring further (don’t judge me). So I imported the list, looked up every address, and ran the JMP Geocoder Add-In to ascertain the longitude and latitude of each restaurant. 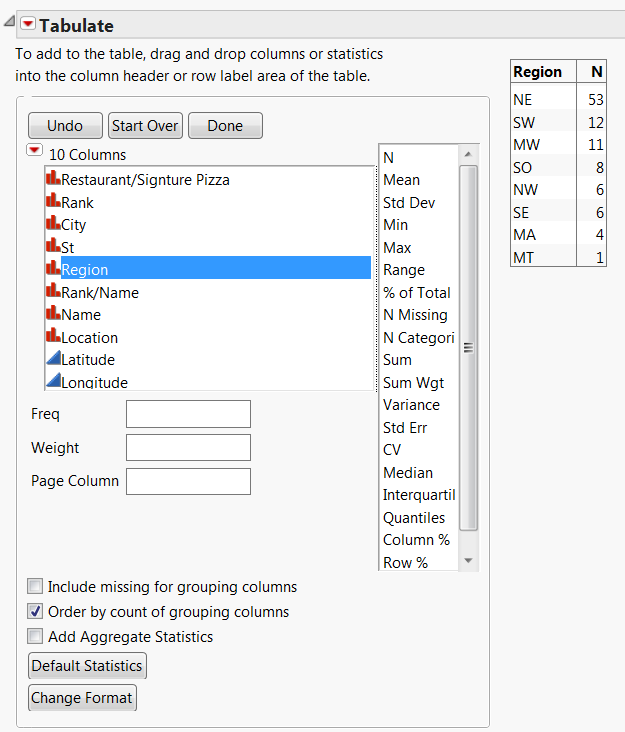 (You can download the add-in with a free JMP User Community account.) 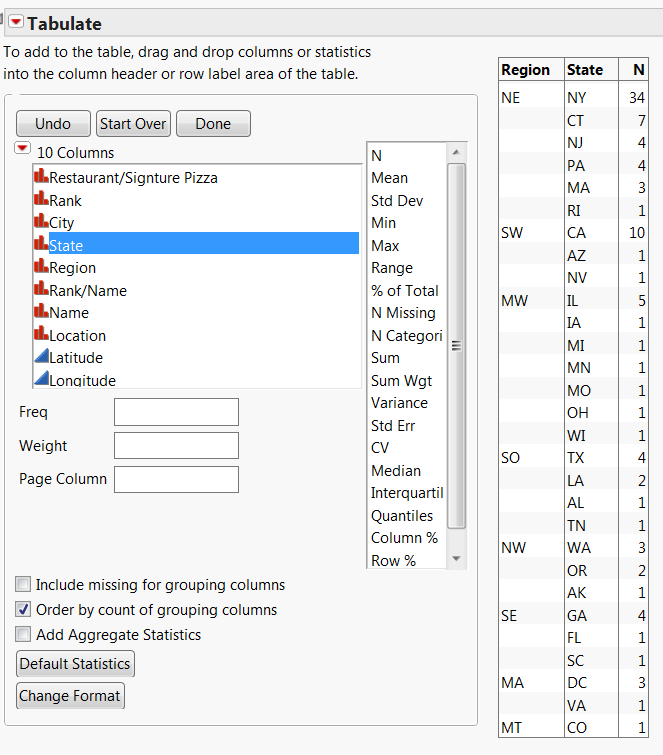 I then used Recode to create a new column for US regions, and started to investigate the data. I first decided that Tabulate would be a good place to start to see which region has most of the winners (you know where this is going, don’t you?). I clicked on the box for Order by count of grouping columns to sort the data in descending order. California was the big winner in the Southwest – more on that later. And of course Chicago dominates the Midwest. 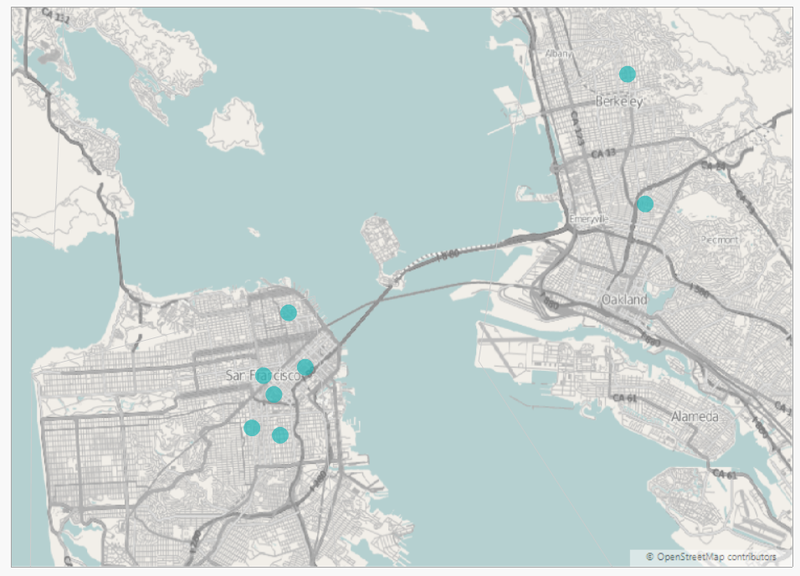 Six of the 10 California places are in San Francisco, with two more in Oakland and Berkeley. So, good for you, folks in the Bay Area! And what did I learn? The biggest concentration of the best pizza in the US is Brooklyn, New York. From my hometown of Bridgeport, Connecticut, all 53 of the places in this area are within a 150-mile radius. But most importantly to me, the No. 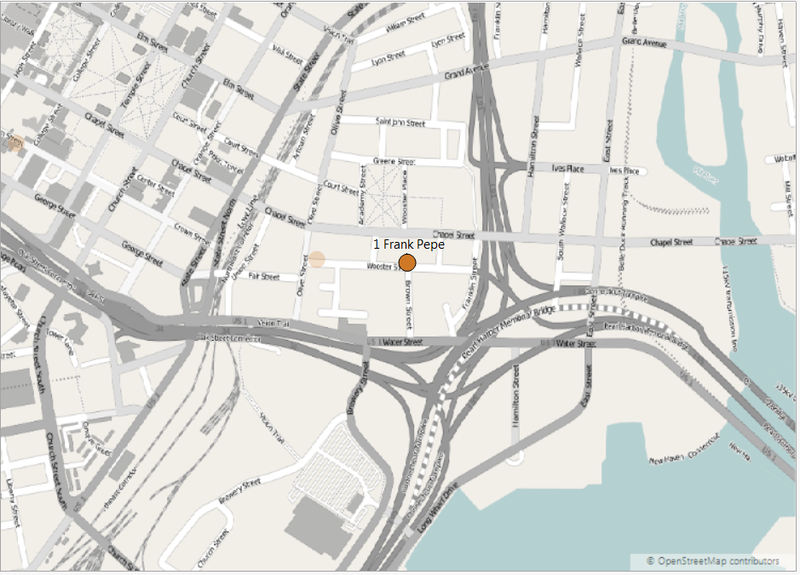 1 spot goes not to a pizzeria in New York City, but to Frank Pepe of New Haven, Connecticut, just 20 miles from where I grew up. I’ll definitely need to have a slice when I’m visiting family. But hey, since they are all within driving distance from Bridgeport, maybe I should hit them all. Before making any inferences from this one should compare the maps above to a map showing where the 78 pizza experts food experts live. The views expressed on this Web site/blog are mine alone and do not necessarily reflect the view of my employer. You make that look easy. Will have to try it. But what ever happened to Mystic Pizza? Or was that just a movie? 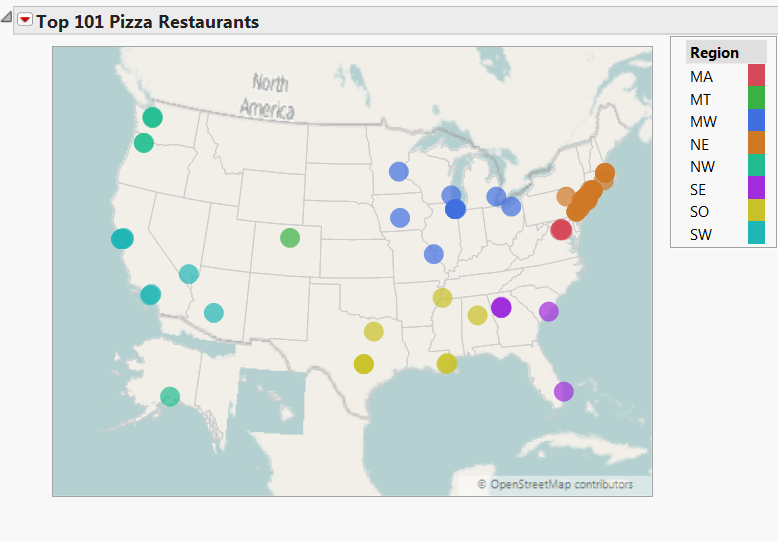 This is great EDA visualization for location, so what do you learn about "signature pizza" types? Point taken. My intent was not to question the methodology, but just plot the results. But, I may have to learn more about the experts. Ah, Mystic Pizza. It's a real pizza parlor. But I was there last year, and it is more of a tourist attraction than a serious pizza restaurant.